This weekend boasts a couple of interesting events, so I have decided to call it the weekend of Country and Celtic! Both the Goderich Celtic Roots Festival and the Exeter Rodeo are on throughout the weekend. I have noticed that these two events have a very different drawing in people, but when you want to get “cultured” in Huron, I say head to them both! I’m gonna try to hit up both events, but also want to try to get to the Bonanza Weekend at Blyth Festival (all four plays in one weekend at Blyth Festival!) and am heading to a friends for a pool party in Sarnia… yes I do leave Huron County once in a while! The ultimate Celtic experience on the shores of Lake Huron. 10 days of musical madness including week-long workshops for children and adults, a three-day traditional music festival, and a rural outreach concert series. Event Host: Goderich Celtic Folk SocietyCanada’s first pan-celtic festival featuring 25 national and international acts. Dance stage, craft art area, children’s area and five side stages, food court. Hands on craft workshops. Now in our 19th year. Follow the road to South Huron for a weekend of adventure that you won’t want to miss. The Ram Rodeo thunders back into Exeter August 5, 6, & 7, 2011. Cowboy up and join the fun and tradition! Annually, on the weekend directly following the Civic Holiday, watch the South Huron Recreation Centre grounds transform into a unique western playground. Bring the entire family out to witness the thrills and spills of this exciting event. 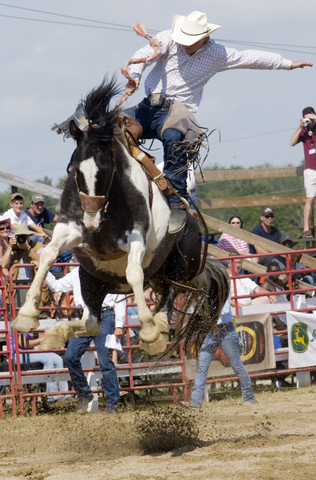 After 14 consecutive years, the Exeter Rodeo continues to attract thousands of enthusiastic fans, eager to capture the challenges, dangers and thrills experienced by the competitors, as they compete against the clock, in this rough-tough sport. Plan for an action packed weekend in Exeter as the Ram Rodeo Tour winds its way through Central and Southern Ontario communities throughout the summer. Don’t forget to purchase your admission tickets to the Exeter Rodeo in advance and save $5.00 per ticket and kids 5 years and under are free with an advance ticket. Tickets can be purchased locally at the South Huron Recreation Centre, Huron Tractor, Hensall Co-Op Gas Bar and Esso. If you are from out of town and want to take advantage of these great savings, go to http://www.ticketweb.ca/ or call toll free 1.888.222.6608 and make your purchases. Tickets will be mailed or you may pick them up at the entrance gate. All proceeds from this unique event are earmarked to go directly back into Recreation projects in the community. Funds secured from the rodeo have been instrumental in creating new endeavours, projects and pursuits in the community. Feel the Rodeo excitement in Exeter on August 5, 6, & 7. For complete event details and ticket information, please contact the Community Services Department at 519.235.2833 or check out the official website at http://www.exeterrodeo.com/ or http://www.ontariorodeo.com/ . South Huron … Ontario’s best kept secret. Throw on your cowboy hat and boots and come experience the playful side of South Huron!